The purpose of this group is to ensure people with disabilities in the Canterbury and West Coast District Health Board areas have the health services they need, and feel included in decisions about their health. The Disability Steering Group (DSG) has been selected to ensure the right balance of representation and has a wide range of relevant knowledge and expertise or experience living with a disability. 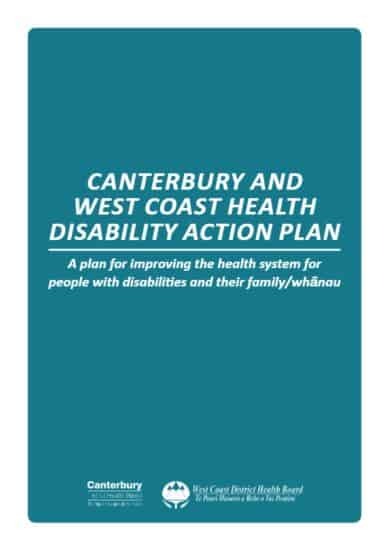 The DSG has the Canterbury and West Coast Health Disability Action Plan as the focus for its work. The Plan identifies short-term goals to be achieved in the first two years, and longer-term goals over the ten year lifespan of the Plan. When we first launched the ten-year Canterbury and West Coast Health Disability Action Plan back in 2016, we set out our priorities for the first two years – which have now passed. We also committed to seeking input from the community periodically during the life of the plan, to allow people to give feedback and to influence the priorities for the next two years. We have designed a simple survey that gives you an opportunity to say what matters most to you and what you think our health system should focus on in relation to improving access to information and services for people who experience disability. We want to get input from people with disabilities, their family/whānau and the wider community on the priorities for action for the next two years that we will aim to deliver to meet the outcomes of the Health System Disability Action Plan 2016-2026. This survey will help the Canterbury and West Coast DHBs to understand the health-related issues for people with disabilities, so we can plan our improvement efforts in line with those priorities. We will summarise the survey results and post this information on our website. We will identify actions we can take to do better. We are committed to regularly asking about how we are doing, so will continue to carry out surveys. The DSG meets approximately monthly. The main points discussed, the advice it provides and the work it instigates are all recorded as key messages. The key messages are public, and are also sent by email to identified stakeholders and any person that has asked to go on the mailing list. Key messages can be viewed in the document library. The DSG also produces an electronic newsletter which is circulated approximately quarterly. It has more information and is addressed to the reader, whereas the key messages are a report of what has already happened. This is to ensure their work is open and transparent and people have the opportunity to provide feedback on the work of the DSG and make suggestions. It is hoped that over time the DSG can increase engagement and exchange ideas and views with the wider community – but in particular, those who experience disability, have someone in their whānau who does, or work within the disability sector and/or in health. The video is in three parts and features people or families talking about their experiences and what they want from their health system. The video opens with retired Greymouth school teacher Margaret Woollett – remember, this is a TransAlpine action plan that aims to support disabled people and their family/whānau on both the West Coast and in Canterbury. The second part features the Andrell family of Burwood (who are here with us at the launch). The final part of the video features Disability Support Advisory Committee member Ben Lucas who is the chef de mission for the upcoming Rio Paralympics and who provided input on the redevelopment of Burwood Hospital.